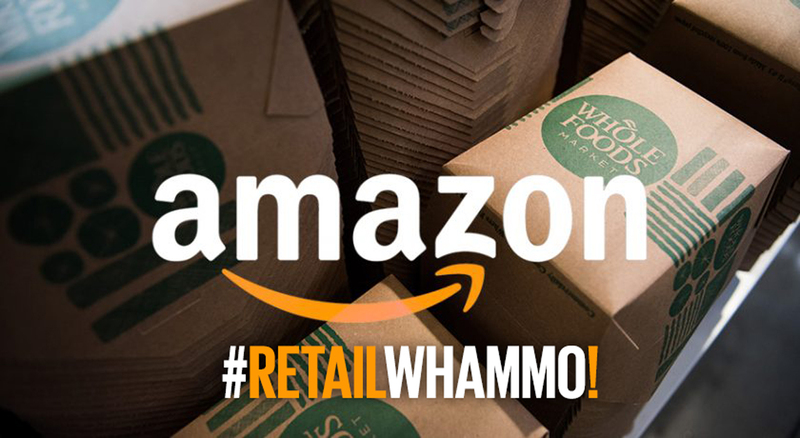 Amazon + Whole Foods = Retail Whammo! Changing the retail model. When Sears was founded in 1893, the general store model allowed retailers to get to know the customer, because the lives of all the people in the town were reflected in their purchases. But Richard Sears turned this world upside down. He figured out the burgeoning railway system. He figured out logistics. He eliminated the local middleman. He built an infrastructure that made the innovative Sears catalogue a household name and a game changer, with a channel that was direct to the customer. The Sears catalogue, along with the exploding transportation system, reduced the friction between retailer and consumer. Déjà vu? Frictionless. This seems to be the key word when evaluating Amazon’s latest move. Amazon has already mastered delivering products from seller and buyer, and in the process has built fulfillment centres within 20 miles of over 30% of its North American target audience. With Whole Foods’ 465 stores, Amazon is now effectively within 10 miles of 80% of its target demographic for same day delivery. When you match this extensive customer proximity with their algorithm for predictive purchasing (if you’re buying vitamins, then you are also likely to need shampoo – yes, we all succumb to it), and wait for it… their fleet of drones, then you have solved for the ever-elusive unicorn – the “last mile”. Now, you can get in people’s heads and ship them products they didn’t even know they wanted while delivering your prepared foods, cut up fruit and sundries. Worst case? The drone has to bring them back. Amazon is effectively building the next generation retail ecosystem for consumers and the ultimate club with Amazon Prime (who knows, perhaps a complimentary grass-fed ribeye comes with your next purchase as a valued customer). And just like Apple with music, Uber with transportation, Airbnb with hotels and Tesla with automobiles, Amazon is doing it with retail. Bezos has perfected the Amazon machine, dumping billions of dollars back into innovation before unleashing it on the hapless retail industry (as it lays off workers, sells off locations, and ducks for cover). If the story of how Sears came into this world has taught us anything about disrupting complexity, squashing friction, and creating a better direct to customer experience… then we shouldn’t be stunned by the new technological world that Amazon is now ushering in. Ironically and sadly, just as Amazon unleashes this new and exciting chapter, so fades the journey of Sears, one of the 20th century’s most notable retail icons.